I am always struggling for good ideas and stuff to feed the kids. Sometimes the thought of cooking overwhelms me entirely but I have two little ones that need feeding even when I can't be bothered. 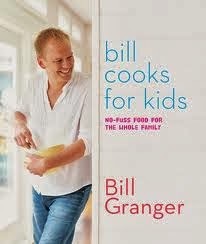 'Bill Granger - Bill Cooks for Kids' it had loads of easy recipes in it that I felt even I could manage. I tried this one the other day and both kids really enjoyed it. I heated a large saucepan with the oil, butter and onion over medium heat. Cooked onion until translucent then added the rice and stirred for a few minutes until the grains glistened. Increased heat to high and added stock, tomato passata and 1 and a half cups of boiling water. Reduced heat to low then covered and cooked for about 20 mins. Stirred in a bit of sugar, basil and added some cooked and sliced green beans. It was really easy which for me is the most important factor along with being substantial and healthy.